Tampa Bay’s heat and afternoon rain showers can make August a very challenging month. Just take what Mother Nature gives you and roll with it. The same pattern holds true from last month. Get out early and fish Tampa Bay’s shallow waters for snook, redfish, and trout. When temperatures rise, move deeper and target the mackerel, snapper and shark. Fishing Tampa Bay, offers a wide variety of species. This is an often overlooked species which I have targeted more this year than ever before. They offer good drag pull and are just flat out fun to catch. Sharks follow the food source. 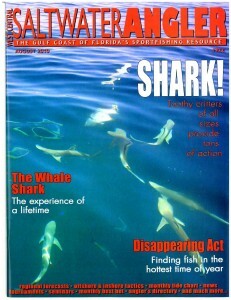 Find areas in Tampa Bay that are holding mackerel and other pelagic species and the sharks are not far behind. As far as rigs go, I like to use a Penn Sargus 8000 with a 40lb class rod. An 80lb Berkley Trilene Fluorocarbon leader with a 6/0 Daiichi circle hook will do the trick. Spanish mackerel is my bait of choice. They are extremely bloody and oily. You will run into reef sharks, black tips, nurse, and hammerheads to name a few. The Spanish mackerel fishing in Tampa Bay bite has been off the hook all summer and will continue to go strong in August. Long shank hooks with 40lb Trilene fluorocarbon leader will make the perfect rig. Use a chum block and live chum baits and you are sure to attract some mackerel action. Any of our ship channels, markers and artificial reefs will attract mackerel. Mackerel not only keep rods bent, they also are delicious to eat. If you haven’t tried them blackened, you don’t know what you are missing. We haven’t seen the big push of mangrove snapper in the Tampa Bay region yet but are hopeful the full moon in July will bring these fish in. Most all the ledges, rock piles, and ship channel ledges will have snapper on it. The key to success is to use as light a tackle as possible. 20lb fluorocarbon and a 1-1/0 Daiichi circle hook will do it. Small white bait will be the best bait. Use live bait to chum the snapper up and drift and live bait back into the chum line and fish on. Also look for these fish to show up inshore around docks and flats with a good bait presence and tidal flow. We should start to see the redfish school up the Tampa Bay region. Look on the flats out front of Simmons Park and the flats south of Cockroach Bay. Get out early and approach these schools quietly and keep your distance. Live white bait (greenbacks), cut threadfin, or cut pinfish will be hard for a redfish to turn down. As the sun gets higher and the water temperatures rise, look to fish the mangrove trees. The redfish use the trees shade to stay cool. The mangroves around Simmons, Little Cockroach, Cockroach Bay, and Joe Island will hold fish. The trout have been plentiful and willing to keep rods bent. Fish any of our regions deeper grass flats in the 5-6’ range and you are sure to catch plenty of fish. Scaled sardines work the best, but don’t forget about artificial. A Berkley Gulp! is hard to beat. There are still plenty of post spawn tarpon hanging around. The bite at the end of July was insane. Look for the fish to move up our region from the Skyway all the way up to downtown. Most live bait will work but a D.O.A Baitbuster trolling series is a great artificial to fool a Tampa Bay Tarpon.